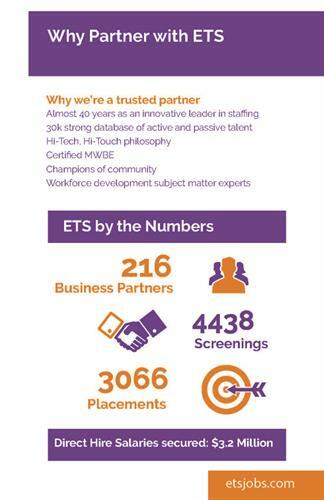 Since 1982, ETS has been dedicated to supporting our vision of building world-class teams. ETS has adopted a “Hi-Tech, Hi-Touch” model that continues to put people first, and align our processes, technology and relationships to meet your needs. Delivering the talent you need when you need it, where you need it. Build a world-class workforce work with a world-class partner. ETS is a group of staffing professionals who know that fitting you to the right culture is more important than just filling a seat. We’ll introduce your unique talents with our top-level connections. Making sure your talent finds the perfect home in a career that will make you happy.